Ejay Falcon wins PPB Teen Edition Plus! Yes, the young poor boy from Mindoro wins this season’s Pinoy Big brother Teen Edition! Not surprising since he has been one of the top favorites since the season began. Robi gets second place followed by Nicole and Beauty rounds up the teen big four. Mabuti naman at totoong pinoy yung nanalo and not one of the fil–ams who have been too common since the franchise began airing locally. Posted on June 7, 2008 Author markkuCategories Daily Update8 Comments on Ejay Falcon wins PPB Teen Edition Plus! Baron’s return a result of Ethel & Mcoy’s exit? Yes, Baron is back in the house. More importantly, he is back after two housemates left the house voluntarily after preventable disagreements with Big Brother himself. I have several reason to believe that Baron’s return is partly a result of Mcoy and Ethel’s hasty exit. After all, the show simply couldn’t go on and rate well without persistent troublemakers. They’ve lost what could’ve been an interesting feud in Marylaine & Jen, and Megan could’ve provided some more things to talk about. They desperately need some trouble inside. And please don’t tell me that it was the votes that brought Baron back inside the house. We all know that. Posted on November 23, 2007 Author markkuCategories Daily Update, Opinion3 Comments on Baron’s return a result of Ethel & Mcoy’s exit? It seems that to some people, Pinoy Big Brother is no longer funny. Of course many of us would agree, and somehow sympathize with Ethel Booba’s and Mcoy Fundales’ decision to leave the Pinoy Big Brother Celebrity Edition 2 after all the things they’ve just gone through. Though Ethel has always been known as a consistent “pasaway,” she does make a few points regarding the sacrifices they were made to endure, despite no signs of any rewards whatsoever. Obviously, she got fed up and couldn’t take any more of it, hastily requesting to leave the house. Though she’s responsible for her actions, Big Brother could’ve handled the situation much better. And then there’s Mcoy’s issue. Having been insinuated upon that he might have produced a plagiarized story for a task they were supposed to complete, the Orange & Lemons frontman took insult and was visibly disturbed on the attack on his artistic integrity. After all, this isn’t the first time he is questioned in such a way, after their song “Pinoy Ako” for the very first PBB was subjected to scrutiny for it being a blatant of a song from an old British band. In both cases, the problem could’ve been handled much better if Big Brother chose to simply let the situation die down. Instead, he chose to lose his cool and present offensive questions to both housemates, resulting in their voluntary exit. He could’ve handled it much better, and there’s no one else to blame. Second Nomination Night: Megan, Zara, & Baron (plus Donald) nominated for eviction! The second nomination night again sees Megan as a nominee for eviction, as she was automatically nominated by Ethel Booba, the current head of household. If she would only try to clean up her act and simply fit in with the rest of the housemates, maybe she’d last this round of evictions. But at this point, would it all be too late? Also nominated is Zara, who figuratively doesn’t exist at all. With the way things are going, she isn’t making any impact and might not get enough votes to keep her inside the house. At the end of this round, she simply might be evicted for not having enough impact at all, be it positive or negative. Lastly, two–in–one housemates (and brothers) Baron and Donald are also nominated, though they are likely to survive with the way things look. The coming week will be very interesting as these housemates do their best to save their slots in Pinoy Big Brother. Posted on October 29, 2007 October 29, 2007 Author markkuCategories Daily Update3 Comments on Second Nomination Night: Megan, Zara, & Baron (plus Donald) nominated for eviction! Perhaps a result of their constant bickering, Jennifer Da Silva and Marylaine Viernes are the first evictees of Pinoy Big Brother Celebrity Edition 2. Though they have worked together as 26K girls in the game show “Deal or No Deal,” they were always bickering and catching too much attention for their own good. Megan Young was sobbing though obviously relieved knowing that she will still be staying inside the house, at least until the next eviction. A first for this season is the “PBB Walk of Fame” where evictees are made to dip their feet in presumably quick–dying plaster cement to document their stay in the popular big brother house. Hollywood–style honors? Posted on October 28, 2007 Author markkuCategories Daily Update7 Comments on Jen and Marylaine evicted! Do you have anything to share about them? Feel free to let us know by leaving a comment. We here at pbb.rebelpixel.com proudly congratulate retzwerx.com for winning the Best Entertainment Blog trophy in the recently concluded 2007 Philippine Blog Awards. Mabuhay ka Retz! I just got a rumor from a very reliable source that gay magnet Bruce Quebral is one of the remaining housemates slated to enter the PBB house in the next few days. This hottie of a model (I sound so gay saying this) used to play for the UP Maroons in one of their never–ending losing seasons. But who cares? His fans don’t give a damn about the Maroons, they just want him bare! 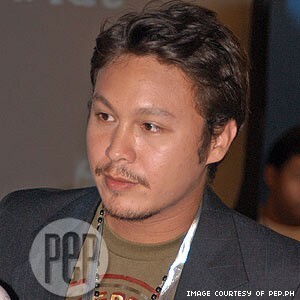 You heard it here first: Bruce Quebral is on Pinoy Big Brother Season 2! Posted on February 26, 2007 February 26, 2007 Author markkuCategories Photos, Rumors55 Comments on Bruce Quebral on PBB2? Tonight’s PBB2 launch has just concluded with six housemates officially inside the house. Just six! I think kuya is reaching into his bag of tricks to get the intrigue and interest going. Having only six should be rather simple and peaceful for everyone, but he made sure he had a Fil–foreign inside who can speak neither Filipino nor English. I couldn’t imagine how the next few days would turn out with all the conversational confusion as well as the surprise as the remaining housemates are introduced into the house. Posted on February 26, 2007 Author markkuCategories Daily Update4 Comments on Just 6 Housemates? The second set of housemates has just entered the big brother house, and it seems finally we have something interesting. Saicy is from Bacolod and Gee-ann is from Quezon City. The sixth housemate to enter is Mickey from Switzerland, who can’t speak a word of English and should provide all the possible twists in the next few days. Mickey entered the house and went directly inside the house, unlike the others who stayed in the garden. Of course it doesn’t make sense to the others for now. So what happens next?